Well our September holiday has come to a close, but with a great ending. When we left Cape Lookout we headed to Seattle for an evening. Usually in the last day of vacation we pick a serviced site in order to clean, vacuum and whatever else the RV might need. But this time we accomplished all that and more in our state park site, even without services. So our evening in Seatlle was spent having a meal out, a bit of shopping and then a riveting game of Yahtzee! Thursday morning we leisurely hooked up and headed to Langley. 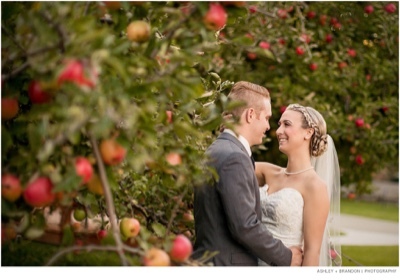 Our weekend was being spent attending a wedding on the island at Merridale Cidery. This last wedding of the year for us was a special young man. Nathan Campbell is the son of Don's cousins Stewart, the same Stewart that I have referred to in previous posts. We were honoured to be invited, and it was a beautiful wedding in a beautiful location. The photo below was taken from the photographer's Facebook page. Alex was a glowing bride! Once again Stewart and Susan treated us to a fabulous time. We walked, toured and ate our way through a few days. Sunday was time to head home, and back to reality! I'm not sure what that means right now. We both have some work days to look forward to and are anxious to see our family. I'm sure my posts will be infrequent until our spring trip, but I'll try to touch base monthly.